It happened during my first visit to the Red Indians of the North American Plains, ten years ago. A spiritual encounter between His Holiness the Jagadguru and a Red Indian holy man has taken place, through the medium of a picture of His Holiness and prayer of the Red Indian. It came about in this way: I was in Sheridan in the State of Wyoming, with my travelling companion, during the All Indian Days. One morning while walking across an open space where the tents or tips, of many Red Indians of different tribes were pitched we heard a voice which seemed to be calling us; we went in that direction and approached one of the tents, asking if somebody had called us and were told that they had. An old man was there, and a younger woman with some children also were present. The old man wanted to know where we came from and who we were, and we told him everything and began to talk about spiritual matters and about the ancient American Indian religion. The old man explained that they were Cheyenne Indians; he spoke about the Sun Dance and said. "Our religion is the same as what is in the Holy Scriptures; God-the Great Spirit cannot be seen, He is pure Spirit." "The Sun and the Earth" he added, "are not gods, but they are like Father and Mother to us; and all the things of Nature, such as streams and rocks, are holy." 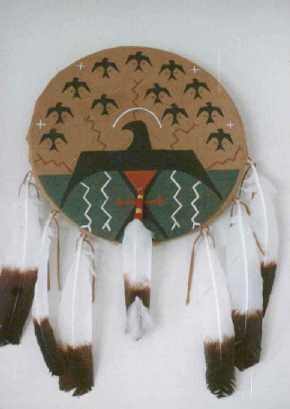 He told us that he was a very important priest of the Cheyennes, the so-called "Keeper of the Sacred Arrows", these are the holy objects of the Cheyennes tribe. They are marvelously beautiful, the old man said, but they are always hidden in a sacred bundle, which is opened only on very few occasion. We were told that these arrows had been brought to his tribe some thousand years ago; that they had been brought by a "Spirit Man", who was transparent; and that the whole tribe witnessed the event at the remote time. The Spirit Man said: "As long as you keep these Arrows, your people will not disappear; if you lose them, the rivers and the grass will dry up". And the old priest added: "May be this would mean the end of the World". Then I showed to him some pictures I had with me. One was the image of His Holiness the Jagadguru of Kanchipuram. I spoke to the old Cheyenne priest about Hinduism and explained to him who His Holiness was. He took the picture in one hand and raised the other hand towards the sky; that is the Red Indian's gesture of prayer. He prayed a long time, always looking at the picture; and after a while, he put his hand on it and then rubbed his face and his breast with the hand, in the Indian way, to impregnate himself with the Jagadguru's blessing. At last he kissed the picture with fervor; during the whole scene I also prayed inwardly with him, and so did my companion. A few years after this meeting, we heard that the Cheyenne holy man-Last Bull was his name- had passed away. One of my friends then visited His Holiness the Jagadguru and gave him a book on Red Indian religion called "The Sacred Pipe" and His Holiness, after having read it, pointed out that the rites of the Red Indians present striking analogies with certain Vedic rites. A few words should be said here about the ancient American religion, or more precisely that of the Plains and Woodland Indians. The most eminent manifestations of the "Great Spirit" are the Cardinal Points together with zenith and nadir, or with Heaven and Earth, and next in order are such as the Sun and the Morning Star. Although the Great Spirit is one, He comprises in Himself all those qualities the traces of which we see and the effects of which we experience in the world of appearances. The East is Light and Knowledge and also Peace; the South is Warmth and Life, therefore also Growth and Happiness; the West is fertilizing Water and also Revelation speaking in lightning and thunder, the North is Cold and Purity, or Strength. Thus it is that the Universe, at whatever level it may be considered, whether or Earth, Man or Heaven, is dependent on the four primordial determinations: Light, Heat, Water, Cold. A most striking feature of the North American branch of the Primordial Sanatana Dharma is the doctrine of the four yugas: the sacred animal of the Plains-Indians, the buffalo, symbolizes the Mahayuga, each of its legs representing a Yuga. At the beginning of this Mahayuga a buffalo was placed by the Great Spirit at the West in order to hold back the water which menace the earth. Every year this bison loses a hair, and in every yuga it loses a foot. When it will have lost all its hair, and its feet, the water will overwhelm the earth and the Mahayuga will be finished. the analogy with the bull of Dharma in Hinduism is very remarkable; at every Yuga, this bull withdraws a foot, and spirituality loses its strength; and now we are near the end of the kali-yuga. Like the orthodox Hindus, the traditional Red Indians have this conviction, which is obviously true in spite of all the mundane optimism of the modern world; but let us add that the compensation of our very dark age is the Mercy of the Holy Name, as it is emphasized in the Manava-Dharma Shasta and the Shrimad Bhagavata and other holy scriptures. Indian holy man manifests his love for a Hindu holy man; secondly, this apparently small incident reminds us of the unity of the primordial Sanatana Dharma, which is more or less hidden beneath the many forms of intrinsically orthodox tradition; and this unity is especially represented by the very function of the Jagadguru, who incarnates the Universal Truth. Thirdly, this little incident making a symbolical encounter between a Red Indian priest and a Hindu priest was in fact an act of prayer; and it show us that in prayer all earthly differences such as space and time are transcended, and that in prayer we are all united in one state of purity in one perfume of Deliverance.